Look at my dad's wallet. on it. I know either he made it or my grand- father, both of them tooled leather. My grandfather made saddles and chaps and it does look all hand-made. Even has a silk lining. 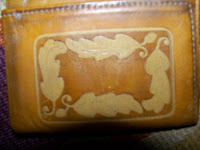 The interesting thing about the wallet is that it is of the oak leaves and acorns. I know he loved the trees here. He didn't name our ranch. Well, he called "Rock Ranch" but I added the "Rock 'n' Oaks" to it and now we even have our brand and logo with the ranch on my FJ and our horse trailer. Everyone tells me now I look like my mom, but when I was young, everyone in town knew me because I looked like my dad. My dad and I both share large foreheads. I used bangs to cover mine and as my dad got older he lost more hair. My son has the same hair-line as my dad. No comb-over for Dustin, he shaves it all off. I wish I had gotten his cute beauty mark on his cheek. It's not visible in the picture, but it was in his smile line. We both also shared big lips and clownie-eyes. Handsome dad, huh? Oh, that picture was on his wedding day. Geez, I look like a guy?